For shots that don't require left or right English, your contact point should be on the vertical centerline of the cue ball. In the pool course I teach, it's shocking how many people think they're hitting the centerline but are way off. To help with this, assume a "set and aim' position, with your focus on the cue ball and the cue tip just short of the desired cue-ball contact point. Pause here. Your forearm should be perpendicular (i.e., at a 90-degree angle) to the cue. Now you can double-check your aiming line, making sure that your stroking arm, cue and head (or, specifically, the dominant aiming eye or chin) are aligned with the aiming line and object ball. The dominant eye is a huge can of worms. 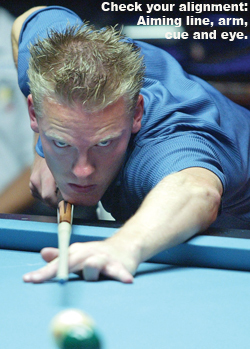 Some people prefer their dominant eye over the cue, and others like the cue under the chin. Some don't have a dominant eye. (Check the November 2007 BD for Tony Robles's advice on cue position.) If you can align your tip with the aiming line, I don't think it matters where your head is. But, however you decide to set up, do it consistently. Begin a series of practice strokes. On every shot, you want the use the same number of practice strokes with the same tempo. You're establishing a routine that you can rely on in more stressful moments. You're also making sure the stroking arm is free from body interference. There's some debate on where to rest your gaze. 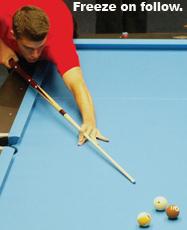 You can move your focus between the cue ball and object ball during the practice strokes (e.g., watch the object ball during the back stroke and cue ball during the forward stroke). Just be sure to watch the cue ball during the forward stroke, so you don't accidentally hit it. Whatever you choose, do it consistently. At the end of your last forward practice stroke, pause again in the set position. Re-verify your aiming line and tip placement. take a slow and smooth backswing and pause at the end before starting your forward swing. Switch your focus to the object ball (or other target point, depending on the shot). You also can focus on the object point at the start of the backswing; whatever works for you is fine. This is the most important point on the list: Transition smoothly from your pause to your forward swing. 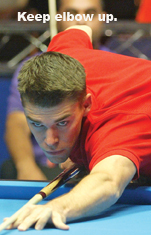 Many intermediate players have difficulty with accuracy because they rush or jerk their cue sticks forward, which throws them off-line. Assuming you're using the pendulum-style stroke, make sure your elbow stays up. (Many elbow-droppers dispute this point, but most people will have better accuracy and consistency if they don't drop their elbows.) As you're accelerating through the stroke, be careful that your bridge, head and body stay fixed. A frequent sin, even with good players, is moving the body up on the shot. 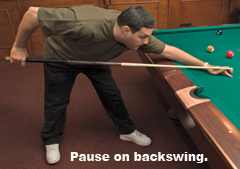 Allow the cue tip to pass through the original cue ball position to the natural end of the stroke. Then freeze in your follow-through position until the balls stop moving (unless you need to get out of the way).